WIDE-RANGING information on how police have been using controversial surveillance drone technology in Northern Ireland can be revealed by The Detail today for the first time. 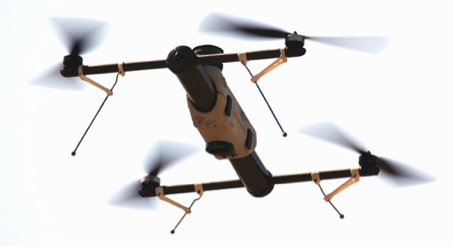 Drones, also known as Unmanned Aerial Vehicles (UAVs), resemble large model aircraft with state of the art cameras used to relay information to police officers on the ground during operations. Some models are capable of intercepting communications and accessing electronic data protected by encryption or passwords. 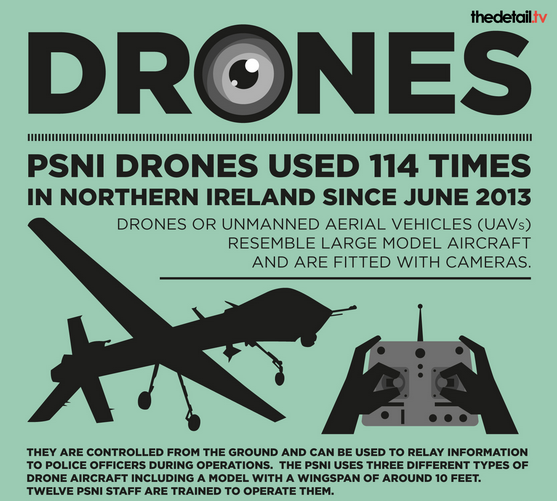 Responding to a Freedom of Information request submitted by The Detail the Police Service of Northern Ireland (PSNI) provided new data on where and when drones have been used here. However police refused to release any information on how or if drones are used in covert surveillance operations, citing national security concerns. Today we map the confirmed use of drones across Northern Ireland. The Detail can also reveal that this latest information comes as the Northern Ireland Policing Board is due to make a decision on whether or not police here should have to make a report to the board every time a drone is deployed. University of Sheffield Professor Noel Sharkey, an expert in robotics and artificial intelligence, said that while he welcomed the PSNI’s willingness to release some new information, he raised concerns about the lack of detail on how it is using drones in covert policing operations. Security forces face the ongoing challenge of pursuing organised crime and paramilitary activity, including by dissident republicans. The PSNI said the primary use of its drones was to provide “overt support” to district policing. - Micro Craft with a wing span of 3.3 feet. - Small UAS with a typical wingspan of 9.1 feet. - Vertical take-off and landing (mini helicopter) with a wingspan of 2.5 feet. The PSNI first purchased drones in June 2013 ahead of the G8 summit in Fermanagh when the leaders of eight of the world’s richest countries met at the Lough Erne Golf Resort. June 2013 had the highest number of drone flights in a single month to date, with 26 deployments made in Police District F, covering areas of South Tyrone and Fermanagh. 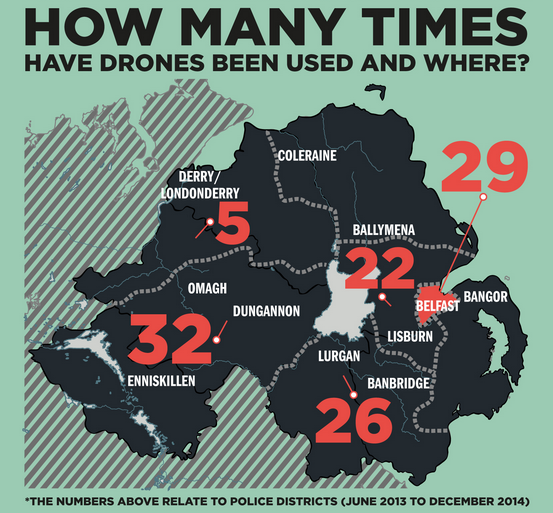 We asked the PSNI if the rise in the number of drone deployments in 2014 meant an increased reliance on the technology for police operations. Responding to The Detail PSNI Detective Chief Superintendent Hugh Hume said: “The increase in the number of deployments does not reflect an operational reliance on Unmanned Aerial Systems. “An initial licence to operate the systems was granted solely to assist with the G8 policing operation in June 2013. No further deployments took place until November 2013 when a final licence to operate was granted. The PSNI data released to The Detail shows that over the last two years police deployed drones across all police districts apart from areas of the north and north east including Down and Coleraine. 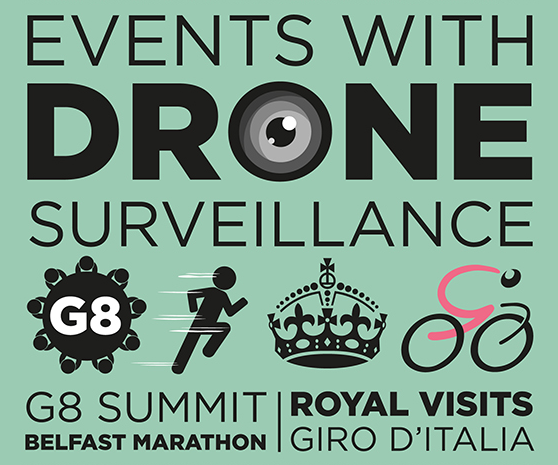 See – District C and District H.
Drones were also used to support policing operations during Royal visits to Northern Ireland, the Belfast Marathon and the Giro d’Italia. In early discussions with the policing board the PSNI advocated the use of drones because they could be deployed easily by police officers on the ground and had lower running costs than traditional aircraft. In response to The Detail’s FoI the PSNI refused to release the duration of time for each deployment because it could “alert those intent on terrorist/criminal activity as to the capability and / or any methodology of the equipment being deployed”. Τhe PSNI also said that at present it did not record any information on the cost of each individual deployment and that the cost of each drone was deemed ‘commercial-in-confidence’. However the police did confirm that the overall cost of the project was £1.5 million. The PSNI must review its licence for operating drones with the Civil Aviation Authority (CAA) on an annual basis and each officer must pass an approved CAA test before having permission to operate one. The PSNI does not need to inform the CAA every time a drone is used and only needs approval if they want to change the scope of their original permission. Under current arrangements the PSNI can operate a drone weighing up to 7kg within a congested area and is obliged to keep the device within a visual line of sight of 400ft vertically and 500m horizontally. The PSNI is due to review its license with the CAA in October this year. Meanwhile a separate 12 month review period overseen by the policing board for the PSNI’s use of drones ended on 1 November 2014 with a report from the board’s performance committee expected in February 2015. Τhe policing board will consider the future oversight arrangements for the use of drones including whether or not the board should be notified every time a drone is used by police. Board members have previously raised concerns about the human rights implications should PSNI drones be used for covert surveillance. When purchasing the drones the PSNI assured members of the policing board that the primary use for the drones was to provide overt support to police but that should a request be made to assist with the covert investigation of crime, authorisation would be sought under the Regulation of Investigatory Powers Act (RIPA). In a document compiled by the policing board it was noted that some models of drones are capable of intercepting communications, conducting covert surveillance and accessing electronic data protected by encryption or passwords. The PSNI did not comment on the capabilities of its drones but did comment on the storing of images. Detective Chief Superintendent Hugh Hume said: “In a situation where images are recorded but are not required for any police purpose, they will be retained for 28 days and then destroyed. “This is the standard applied across the UK for CCTV systems and as such the PSNI consider it to be the most appropriate for images recorded by UAS. “In the event that a policing purpose is identified which requires the retention of the images, the relevant legal and policy provisions will be applied and complied with, for example, RIPA”. The police pointed to the fact that UK faces a serious and sustained threat from violent extremists and that the threat in Northern Ireland was deemed “severe”. In a statement the PSNI said: “As you may be aware, disclosure under FOIA is a release to the public at large. Whilst not questioning the motives of the applicant, confirming or denying that any other information regarding the covert use of this equipment is held would show criminals what the capacity, tactical abilities and capabilities of the Service are, allowing them to target specific areas of the UK to conduct their criminal/terrorist activities. Professor Sharkey believes that while drone surveillance could assist police in tackling terrorist activity or serious crime, he warned that any misuse of the technology could impact on people’s basic human rights. He said: “Information on covert deployment should be transparent. There is always an issues between transparency and security but there needs to be clear accountability. “We should be able to know more about why something is covert without revealing sensitive security information. 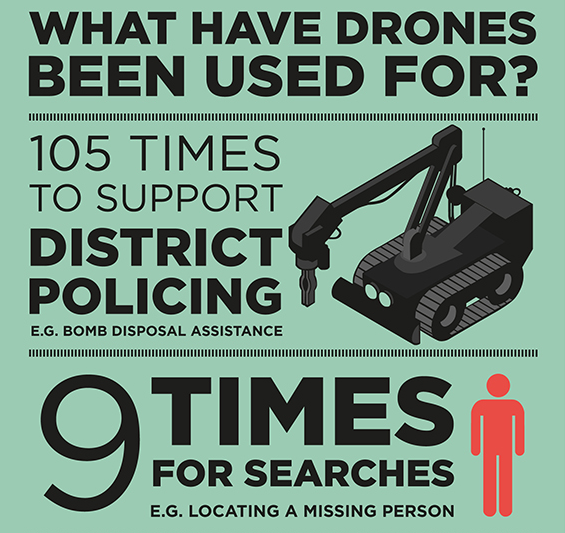 To view The Detail’s info-graphic on the PSNI’s use of drones in full click here.